Parvathamma Aiyappa runs a small tea shop in a village near Kengeri. This is where she lives. She also works occasionally as a domestic helper. With some savings, she managed to get her two sons – Shivaraj, 12, and Amar, 13, to a not-so-nearby school run by a welfare society, where she has to pay a nominal fee for books, admissions and uniforms. Her husband is a labourer. Parvathamma Aiyappa with her children. Pic: Lavanya Keshavamurthy. Being the self respecting mother that she is, she refuses to accept any donations for their education from the well-off families where she works. The school was a bit far for the boys to walk – 3.5 kms to be precise. She could not afford the school van fees and BMTC buses do not ply in the area. However, RR Cycles, Madivala bought back an old, unused cycle – a kid sized Hercles MTB – from one of their customers, fixed it and gave it to her children. Shivaraj and Amar take turns to ride the cycle. While one of them carries both the bags and ride the cycle to school, the other walks along. RR Cycles has been associated with RideACycle Foundation as a logistics partner for the Cycle Recycle project for more than a year now. They accept/buy old cycles from their customers, repair them and contact the Cycle Recycle team whenever a cycle is ready to be used. The team members knew about Parvathamma’s situation and got in touch with her. RideACycle Foundation encourages cycling – as a form of recreation, sport and also as a means to commute to work. So far RideACycle foundation has donated around 12 cycles to school children though associations such as Dream School Foundation and India Literacy Project which work for the welfare of underpriviledged children. But in some cases, it is through word-of-mouth that the foundation gets to know about those in need of cycles. One of them is Parvathamma’s case. Parvathamma offered to pay for the cycle in instalments, but when the team members explained to her the concept of Cycle Recycle, she was convinced and said, “God bless the donor." She laughs lovingly when Shivaraj says he wants to become a doctor and Amar says he wants to become an engineer. Hope the cycle makes the journey to their destinies more enjoyable. If any one wishes to donate an unused cycle, one can write to eval(decodeURIComponent(‘%64%6f%63%75%6d%65%6e%74%2e%77%72%69%74%65%28%27%3c%61%20%68%72%65%66%3d%5c%22%6d%61%69%6c%74%6f%3a%72%65%63%79%63%6c%65%40%63%79%63%6c%65%72%65%63%79%63%6c%65%5b%64%6f%74%5d%69%6e%5c%22%3e%74%68%65%6d%3c%5c%2f%61%3e%27%29%3b’)). Shivaraj and Amar are about 4 1/2 feet tall, so any cycle that suits this height should work for them. 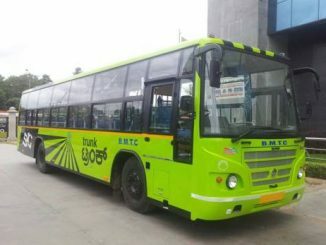 Will Bangalore buses run for the people, or for profits? The increase in bus fares by the BMTC has received a lot of flak from commuters. Here’s a look at how the hike is affecting the common man and what the future could possibly hold. good to be aware of this initiative..